Where do you begin to save money this winter? Learning to save money this winter isn’t difficult once you stop making assumptions. Take a look at your bank account to see where your money is really going. You’ll instantly find ways to trim your budget. Once you’ve found all the ways to save on spending available, check out opportunities for earning more money. The winter months are the perfect time to store away extra cash. Are chilly temperatures encouraging you to stop for coffee more often? Does the weather prevent you from getting out to use your gym membership? What about your electric bill? Has it soared under the weight of the winter’s cold? Make a note of your biggest extra expenses, and then form a plan of attack to reduce each one. Maybe sorting through bank records isn’t your thing? If you find this step too overwhelming, there are several apps you can use to do the job for you. They comb through your purchases and categorize them by utility, entertainment, food and so on. You can go back through and make adjustments, but once a purchase is set in the system, these programs make it easy to see where your money is going. Worried about logging into your banking accounts with an app? Try BudgetPulse for a safe and secure look at your finances. Other programs go the extra step and make it easy for you to fine-tune your budget to support savings. Acorns and Qapital, for instance, take the spare change left over from your purchases and put the money in savings or investments. Qapital and Stash automatically move money left over from budgeted purchases into your savings accounts. 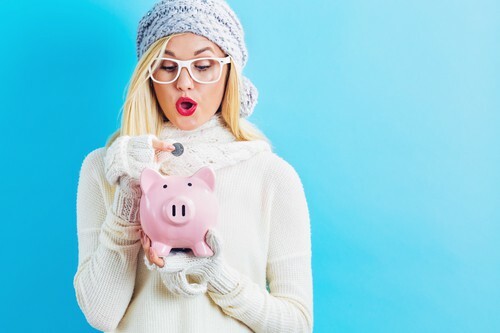 The winter presents challenges you won’t deal with at any other time of year, so it makes sense you’ll have extra expenses this season that don’t factor into warmer months. The budget for ChapstickⓇ alone could bankrupt a person. If you’re using too much of it while you spend most of your time indoors, however, that spending could signify a different problem. It might be one with a cheaper solution! For instance, cold air is dry air, but too many people ignore the big picture. They only run the heater during winter months and do nothing to correct the low humidity within their homes. The result? Dry, brittle hair. Dry, flaky skin. Irritated eyes, nose, and throat. Chapped lips. A $30 humidifier might offset your need for such an expensive winter beauty regimen. Likewise, investing in higher-quality wool socks and gloves could alleviate the need for disposable hand-and-foot warmer packets. Look at the items you buy repeatedly during the winter you could replace with one lasting product. It might be more expensive once, but over time, the item will pay for itself. Simply being more mindful about what you purchase and why can put an end to wasteful habits. Unfortunately, if you’re too strict with yourself, it can also lead to splurge-spending once your willpower runs out. Be sure to focus on moderation. Don’t be too hard on yourself. Half of saving money is cutting your expenses. The other half? Finding ways to earn more cash. There’s only so much you can trim from your budget, but there is promise found in chilly weather. People will pay someone else to perform services they don’t want to do themselves, and there’s nothing like winter to motivate people to bundle up and stay indoors while someone else runs errands. Hosting park days for other people’s kids! Check with your local courthouse in regard to business regulations, and talk to an insurance salesman about the most affordable policies you can count on for protection. Side hustles are an excellent way to pad your savings account. Just don’t ignore the risks. You want to be sure you’re covered in case anything happens. Between trimming back your expenses and finding new sources of income, you’ll end the winter months with a stash of cash you have available when emergencies arise. While you’re working on learning how to save money during the winter, an auto pawn could help. Call your nearest Title Tree location for help now.